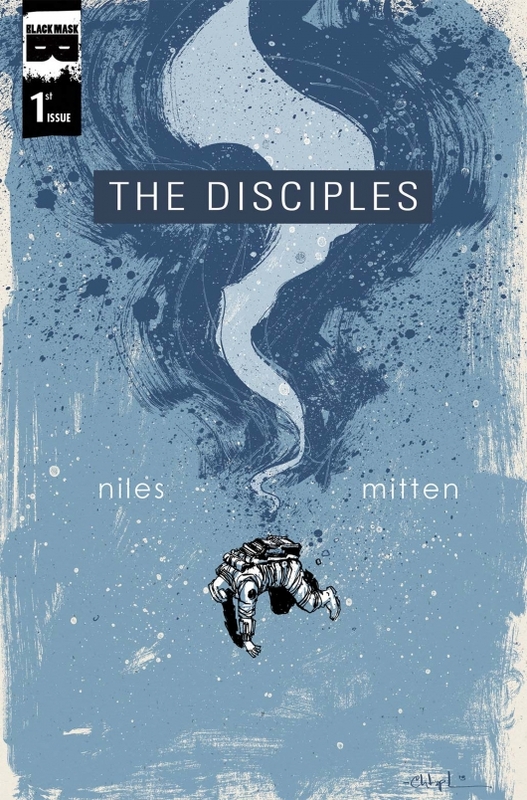 The Fellowship was fortunate enough to obtain a copy of THE DISCIPLES #1 from Black Mask Studios. Steve Niles writes, Christopher Mitten draws and Jay Fotos colors. The Starship Venture and her crew are getting back to work quickly after their last job. This new job is to make the trip out to Ganymede to “rescue” a Senator’s daughter from a wealthy recluse slash possible religious cult leader. It’s clear early on that something is different about this trip, too – and it gets really weird when they discover their stowaway. Venture’s not a large ship, as we can gauge by her crew of three (not counting Nessie). This issue gives us some really good character building, with a bit of creatively placed exposition along the way. There’s a ton of questions raised, as in any good first issue, and that’s multiplied by the future setting. The art is just beautiful; faces are both simple and wonderfully expressive, and the coloring of the space-scapes is stunning. The amount of science fiction potential in this book is amazing. And I’m already hearing news of TV development (check out the Black Mask website to learn more). I’m hooked, and you should be, too. THE DISCIPLES #1 is available now at your FLCS or at blackmaskstudios.com.